I'm a Canadian who's been living in China for the past 11 years. It was originally a six month trip... And I'm still here... But, that's another story. When I first got off the plane, I had no idea how to say "hello" in Chinese. I wouldn't have even been able to differentiate between Chinese and Korean at the time. The first time I realized I wanted to make an attempt at the language was when my best friend, who was with me at the time, said "er shi" or "20" to a taxi driver. I could see the driver understood, and I remember being truly amazed. My competitive nature kicked in, and I bought some old school books on how to learn Chinese. I dove in and started memorizing a few random characters. The local people around me seemed super impressed when I was able to recognize a handful of characters. Maybe they were just being polite, but I didn't care. I took it as a compliment and I decided I was going to learn the language. 1. I didn't have a super talent or knack for languages. I was horrible in French class, and to this day I only know a few words in French and probably couldn't count to 10. 2. Learning Chinese was more fun, more interesting, and easier than I thought. 3. The language learning materials back then were HORRIBLE. It probably took 5-10 times longer to learn back then than it would today with the right approach. 4. Most people had a really limiting belief system when it came to learning Chinese. I'm generalizing here, but I remember it being incredibly true almost across the board. Western people kept talking about how "difficult" it was, even if they'd never tried. They just figured it must be difficult, and they kept on repeating that mantra. Chinese people were also always talking about how hard the language is, and how many different meanings different words had. Everyone made me feel like it would be impossible to learn anything. Most people quit before they even started. And all the people I know now who are in that boat have major regrets. Back then, there was one western guy (Da Shan) who spoke fluent mandarin. Literally every person I spoke with across the country knew him. But he was touted almost as some anomaly. He was like the exception who proved the rule. One guy was able to learn the language, but that was it. Fast forward to today. A lot of foreigners here are able to speak, read, and write. Depending on what circle you are in, it's not THAT big a deal anymore. But still, most foreigners do not speak well, and most of them will tell you that they wished they studied more, and that they wished they had a better method. For many western people who are thinking of coming to China, or for people who have been here for a few years, the old attitudes and beliefs about learning Chinese still prevail. I would like to respectfully disagree with most of the sentiment of the article. It's exactly this type of belief system that keeps people from learning Chinese. And it's this type of thinking that makes some people believe, wrongly, that learning Chinese really isn't that important or that useful. And also that it's extremely difficult to the point where one should consider not trying at all. Before I jump into specifics for why I disagree in the next blog, I want to open this discussion up in the comments section and see what you guys think. Do you share similar views? Do you believe learning Chinese is either a waste of time or something that isn't really that useful or necessary for business? What do you think of this? Honestly. I'm quite curious. I'll write my views in my next post. I've talked with quite a few teachers about how to help the students practice typing Pinyin as part of their Chinese language learning experience. Many teachers believe that they will have to purchase one of the products on the market for practicing typing Pinyin. Let's think about this - the reason students need to learn typing Pinyin is because at certain point they need to be able to "type" Chinese characters on the computer. If that's the objective, why don't we get them to use the native Pinyin input already available on Windows and Mac, instead of using a third-party tool that is not going to be used in real life for inputing Chinese? Some teachers would like the students to see the Pinyin annotation along with the Chinese characters. That capability is also available online for free. Why spending hundreds of dollars buying a piece of software while you can train the students using Pinyin in the natural way for no cost? This blog explains how. First, you need to set up the computer operating system to allow students to type Pinyin to enter Chinese characters. Click here for the FAQ on step by step instructions. Once set up, students can enter Chinese characters in MS Word or a text editor with Pinyin. 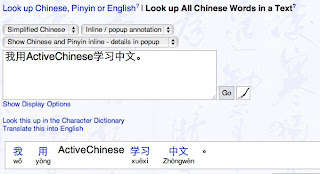 To see the Pinyin annotation along with the Chinese characters, we recommend the following free on-line tool. You can then have the students input Chinese in the text box with Pinyin input method available with Windows or Mac. There are some other nice features like mouse over to show English translation. Next to the Go button, there's a button to bring up the character writing/recognition interface to allow students to enter Chinese characters through a writing pad and character recognition. Hope your students will enjoy using the tools and learn the Chinese character input skills that they can truly utilize in the future. In today's economic environment, being able to do this without costing anything is certainly a nice bonus. I look forward to hearing your feedback of my blog. You can use the comment link below to provide your input and ask me questions. We are honored to be invited by Nokia to receive the 2009 Calling All Innovators contest award in Stuttgart, Germany on September 1 and demo the app at Nokia World. Our app will also be featured in Nokia's Ovi Store. ActiveChinese was chosen from over 1,700 submissions from developers in 85 countries. Click here to read the full press release from Nokia. Click here to check out our mobile app and cast your vote of our app as your favorite. - PPT for Pinyin introduction: we built a set of PowerPoint slides to help teachers introduce Pinyin in the classroom. 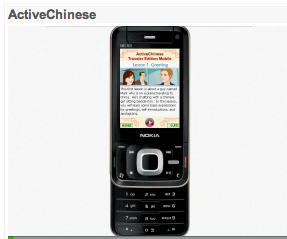 To download these slides, you can sign up for free trial of the ActiveChinese School Edition at www.ActiveChinese.com and look for the slides under teacher resources after you log in. Have a great new school year and happy teaching. Click on each frame above to get a larger view of the picture. The way to give business cards in China is to both pass and receive a card using both hands. The person giving the card will also present the card with the words facing the receiver. This way the person receiving the card will immediately be able to read it. It is also polite to address the person with their job title and name directly after receiving the card. I'd like to hear the "culture shocker" that you have experienced.